Can Dundar is the former editor-in-chief of Cumhumriyet, a newspaper that is staunchly critical of the Turkish government. 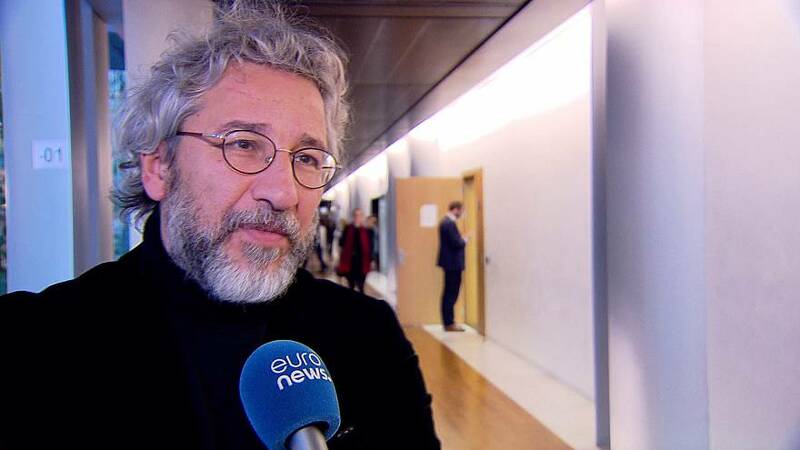 Dundar was one of the finalists for the European Parliament’s Sakharov Prize, an annual rights prize handed out by MEPs. Euronews correspondent Sandor Zsiros caught with him at the European Parliament in Strasbourg, France last week. The news broke on Monday that more of that newspaper’s journalists had been arrested by Turkish authorities, including Dundar’s successor as editor. Mr Dundar how do you see the situation of the freedom of press in Turkey? And what can the EU do about it? This is the worst period of time in our history for the media and the journalists. We’ve been suffering a lot. It was not better before the military intervention attempt but after that it’s really hell. And Turkey became the biggest prison for journalists and only a couple of papers and just one TV station have been left and suffering and struggling. This is more or less the position of Turkish press and Europe should of course support the struggle of the journalists at the moment and should stop the aggression of the Turkish government by using all kind of means but unfortunately they are a bit reluctant to support the journalists and to give a clear sign to the Turkish government. Maybe they do so because of the EU- Turkey migration deal. How do you evaluate the EU- Turkey refugee deal in this regard? I call it a dirty deal because Erdogan is using the refugees to convince the Europeans to keep a close eye to his oppression. And that’s why I said a dirty deal. And Europe unfortunately is so scared annoying Erdogan and that’s why they are not vocal enough against what it’s going on in Turkey. Now they understand more the amount of the oppression but still they are waiting for him to turn this into good. Sandor Zsiros, Euronews: Just two weeks ago a major newspaper was shut down in Hungary. What is your message to those journalists who are now without a newspaper? We have 150 now, so it’s incomparable. But, of course, as a country of the EU it is really shocking. So, we need a kind of solidarity among the journalists under the oppression. So, Hungary and Turkey are very similar examples in Europe. Not only those but all journalists should defend the rights of freedom and expression. These are western values, don’t you think so? We have to defend them. And if you sacrifice those values just to stop the refugee flow, it will be a kind of betrayal for the Europeans unfortunately.